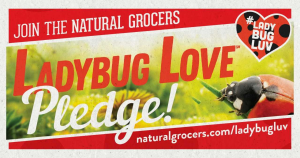 (Beyond Pesticides, April 2, 2019) Throughout the month of April, and in celebration of Earth Day on April 22, Natural Grocers is inviting the community to pledge to protect one of nature’s most beloved beneficial insects—the ladybug. From April 1st through the 22nd, Natural Grocers will donate 10 cents to Beyond Pesticides for every pledge taken on their website, up to $25,000. Pledge takers will commit to never use chemicals that are harmful to ladybugs and other beneficial insects, and to support 100% organic produce. The stability of our food web depends on insects, but recent studies suggest they have declined by more than 75 percent in the last three decades. [i] Agricultural pesticide use has steadily increased since 1960. [ii] According to the most recent EPA report (2012), estimates of annual pesticide use in the United States topped 1 billion pounds[iii] in 2011 and 2012, and 88 million U.S. households use pesticides at home. [iv] Natural Grocers is excited to partner with Beyond Pesticides to keep the public informed about the threat toxic pesticides pose to human health, insect health, and the health of the planet. Take the pledge today at https://www.naturalgrocers.com/ladybuglove/! [i] Hallmann, Caspar A., et al. “More than 75 Percent Decline over 27 Years in Total Flying Insect Biomass in Protected Areas.” PLOS ONE, Public Library of Science, journals.plos.org/plosone/article?id=10.1371%2Fjournal.pone.0185809. [ii] Fernandez-Cornejo, Jorge, et al. “Pesticide Use in U.S. Agriculture: 21 Selected Crops, 1960-2008.” Https://Www.ers.usda.gov, May 2014, www.ers.usda.gov/webdocs/publications/43854/46736_eib124_summary.pdf?v=41830. [iii] Alavanja, Michael C R. “Introduction: Pesticides Use and Exposure Extensive Worldwide.” Reviews on Environmental Health, U.S. National Library of Medicine, 2009, www.ncbi.nlm.nih.gov/pmc/articles/PMC2946087/#R1j. [iv] “Pesticides Industry Sales and Usage 2008-2012 Market Estimates.” Https://Www.epa.gov, 2016, www.epa.gov/sites/production/files/2017-01/documents/pesticides-industry-sales-usage-2016_0.pdf. pages 9 and 21. This entry was posted on Tuesday, April 2nd, 2019 at 2:09 pm	and is filed under Uncategorized. You can follow any responses to this entry through the RSS 2.0 feed. You can skip to the end and leave a response. Pinging is currently not allowed.